Hair today and Hair tomorrow. Yes I know that was corny, but that is how I feel about hair. I like the opportunities to learn and try new things with hair, and I don't want to learn new things on the hair growing from my head, so extensions give me those opportunities. If the hair doesn't work out, I just try on some different hair. Plus who doesn't want to be Tammy one day, Vera the next and Candy at the end of the week. (Names came from the top of my head, I should definitely work on my alter ego.) I like the versatility that units and extension give. I also like when I can get a good deal on some good hair. I must say that I got a great deal on the hair we are reviewing today. 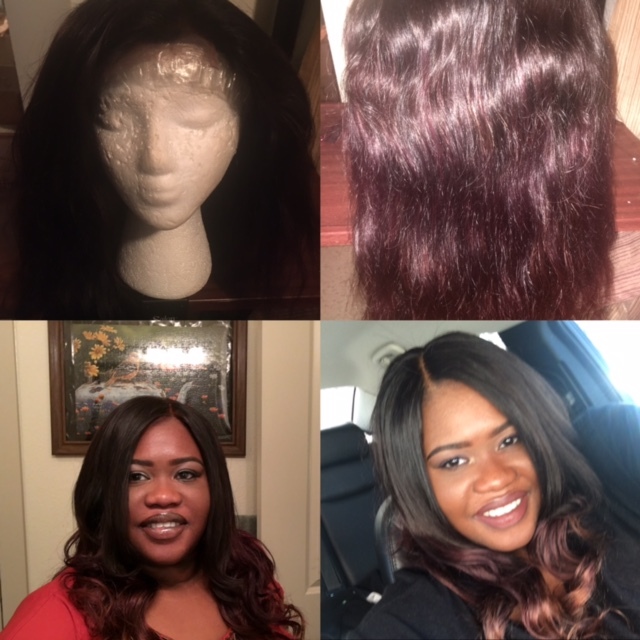 I went on Ali Express in November during the Veteran's Day sale and was able to purchase this hair for less than $70. I purchased three bundles and a closure of Brazilian hair from BlingHair Factory Outlet Store. The hair bundles were 14',16', 18', and a 12 inch closure. The hair came packaged very nicely. It came in a sealed bag, with instructions and some nice eyelashes. (We will talk about my journey to learning to put on eyelashes.) Each item was labeled and in their own package. The closure was well packaged and was nice and full. I did bleach my knots and it took the bleaching the knots well. I didn't get a shot of the closure after bleaching the knots. The hair was very soft and full. The hair was light-weight, but had a lot of volume as the hair was healthy from the beginning to the end. It had very little beards on the bundle. I did color the ends of the hair as you will see in the below pictures and it took color very well. I did not leave the bleach on long, no more than 20 mins and it still picked up the Texture and Tones Clairol Cherrywood color very well. I left the longest ends with the bleached color only as it made a really nice 33 (brown- blond) color. I would highly recommend this hair as it stayed soft after the bleaching and coloring process and still doesn't do much shedding. Now you may not get this hair for the same price that I got the hair on sale, but it is still a very reasonable and affordable price. If you are interested in the hair, please follow the links below.